This is a set of promo materials I just developed for a fundraiser coming up to support the work of GHCC missionaries, Marty & Carol Pelton. 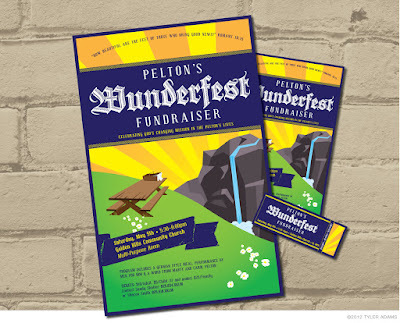 Since they are returning home from Germany, and the fundraiser features an authentic German meal, I tried to develop the look based on old German-style posters with bright, bold colors and simplistic illustration. I wanted the illustrations to invite thoughts of spring countryside picnics where people enjoy God's creation and a good time.